This year we spent Christmas Eve with Greg's family in California. One of their family's traditions is a Christmas Eve party that is themed. For example, the first Christmas I spent with his family was Hawaiian theme. You dress for the theme, we play games araound that theme and eat food that matches the theme as well. It's really fun! This year it was Country Western theme. So we all got dressed up in Cowboy attire and headed to the party. The first part of the night was a suprise but all that we were told was that it would be outside, and dealing with horses. Little did we know that we were in for a Santa driven, horse drawn, trolley ride adorned with Christmas lights and music. So cute huh? Here is our little family in front of the trolley...isn't Greg one good lookin' cowboy? Maddux wan't too sure about the huge horses...you can tell by the watchful eye he has on them. After the trolley ride we headed back to his Aunts house for chili, cornbread, coleslaw, and Resses peanut butter cup s'mores for dessert. It was a really fun Country Christmas Eve! 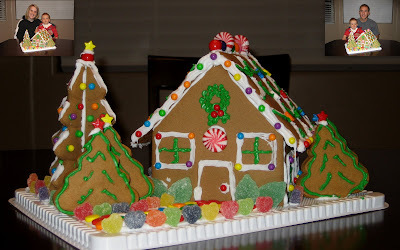 For family night we bought a Costco gingerbread house kit...It turned out pretty good. Here is a picture of our masterpiece! Maddux wasn't much help...he just wanted to eat all the candy and icing...but it was fun to do together. At first he was very unsure of the whole cake but he quickly figured it out and ended up LOVING it! Here is the little cake they made for just Maddux to devour all by himself! On Saturday morning of Thanksgiving weekend Maddux woke up and was having trouble breathing. He was taking really short quick breaths and couldn't seem to get a good deep breath. We were still in Las Vegas but Greg and I were worried about him so we called our paediatrician in Cedar. After telling him what was going on he suggested that we either bring him to his office or take him to an emergency room in Vegas. So...we rushed home and met the doctor at his office where he proceeded to try a breathing treatment with Maddux and check his oxygen levels and determined that he was under respiratory distress. He told us his recommendation was to admit him to the hospital so he could get on oxygen because he believed that if he continued to breath the way he was that eventually his little body would give up because it was having to work way too hard to get oxygen in. I was so scared and in tears as we took our little guy to the hospital. We ended up having to stay at the hospital over night and most of the next day too. BUT I am happy to say that after one purchased nebulizer, lots of breathing treatments, two ear aches, and one hospital stay later he is home, happy, and on his was to healthy! It was a terrifying experience and one I would be happy to never repeat! This year we were lucky enough to spend Thanksgivng with my family in Las Vegas. It was a strange year seeing that there was only seven of us total at the dinner...which is a small group compared to other years. It was fun to cook all day with my Mom and little sister Deidre while Greg, Dad, Grandpa, and Maddux watched football. Here are a few pictures of the day! Maddux ready to eat his First Thanksgiving dinner!